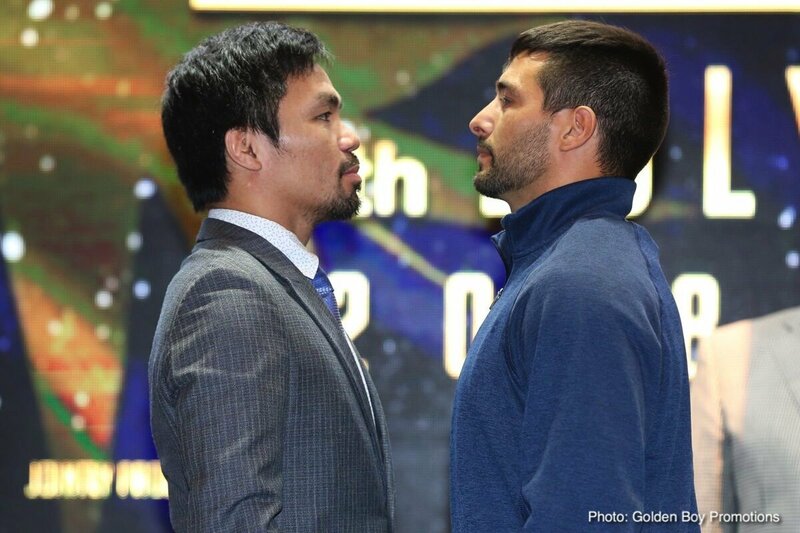 This Saturday night on ESPN+ Manny Pacquiao and Lucas Matthysse meet across the Pacific in Kuala Lumpur, Malaysia. Although both combatants are clearly past their primes, they still have an opportunity to earn some cash and add to their respected resumes. It’s a battle to remain relevant if Matthysse wins he could meet Terrence Crawford in a so-called unification fight not to mention becoming Keith Thurman’s mandatory. If Manny is victorious it puts him in line for a possible meeting with Vasili Lomachenko at lightweight or catch weight in December. With still plenty at stake one can only assume that both men will come in shape physically and be mentally ready for a tough outing. In fact one could argue mental state is one of the most important keys to this matchup. If either boxer doesn’t bring the right mental focus it will likely end brutally. Many examples exist in boxing history, when a great champion doesn’t resemble the fighter we fell in love with. As the years fly by it becomes harder and harder to summon the mental fortitude needed to take and give out punishment. The last time these two action-packed guys fought in separate bouts both looked mediocre at best. Pacquiao was a shell of himself against a bigger rough-house-type in Jeff Horn. Manny struggled in spots especially in the clinch, until the 9th round came around. That’s when Pac-Man hurt Horn, turning up the heat in the form of combination punching. The bell rang to end the ninth and Horn was staggered but still on his feet. The old Manny would’ve attacked out of the gate in the 10th like a Tasmanian devil. Most think Pacquiao did enough to win last July, however the judges didn’t agree. Lucas Matthysse’s last outing came against an undefeated opponent very few had even heard of prior to landing a main event spot on HBO. To be downright blunt, Tewa Karim didn’t belong on that level, which became evident once the opening bell rang. That didn’t stop Lucas from an underwhelming performance, to be fair ‘The Machine’ did manage to get the stoppage. Other then the knockout, Matthysse was very sluggish and had difficulties finding his timing and rhythm. These two are definitely known for being big punchers out of this last generation. Excluding Pacquiao’s technical-stoppage of Miguel Cotto, neither has proven to be able to really crack as a full-blown welterweight. That’s not to say power punching won’t play a part, just not as much as it would circa 2009ish. Beyond the aforementioned mental strength factor, skills ultimately pay the bills favoring the sure fire, 1st-ballot-hall-of-famer Manny Pacquiao. The difference in hand and foot speed will help Manny get off to a relatively fast start. Look for Manny to use his quickness to dart in and out, along with some lateral movement to avoid Matthysse’s power shots. This podcaster/blogger believes Pac-man will respect Matty’s power and attempt to build up a lead on the judge’s cards by scoring points via clean punching. Pacquiao’s jab and right hook, combined with his Sunday punch left hand will secure the victory. It won’t be a walkover so expect moments of give and take within the rounds. Lucas should really focus on rapid fire jabs and cutting off the ring to force Manny on the ropes. When on the ropes Manny tends to put up a high-guard, ear-muff defense that can be exploited. Also, Lucas should attack the body to test just how dedicated Pacquiao is with a Freddie Roach-less training camp. If Manny was distracted with his Senator responsibilities more than the norm, he will pay the price, the same goes for Matthysse as well. No, the style matchup won’t be as thrilling as it could’ve been say a decade ago, however expect a very good, not great fight that will entertain us boxing degenerates. If the rounds are close and overall it’s a tight fight, the location of this event will obviously help Pacquiao. My Official Prediction is Manny Pacquiao by Unanimous Decision. Side Note: If you want to see a glimpse of the next generation take a gander at Regis Prograis this Saturday night on ESPN.